Now to evaluate Avent’s argument that taxing fossil fuels is a good way to induce new technology, consider an analogy. Suppose that there is a chemotherapy drug that increases five-year survival rate for a specialized type of cancer from 10 percent to 60 percent, but with horrible side-effects. Some scientists in a couple of university labs have had some promising results with basic compounds that might or might not ultimately be precursors to a new drug that could get better increases in survival rates, and without many of the awful side effects. If you believed that improving treatment for this disease should be a major public priority, would your preferred approach be to add a large tax to chemotherapy? This is, in effect, what Avent is proposing as way to encourage the development of alternative energy technologies. I’d fund NIH research into the new alternative drug. I don’t think this analogy holds water. In the case of the drug, you have something that, even though it’s imperfect, is better than nothing. In the absence of alternatives, most of us would prefer to make the bad drug as widely available as possible even if it does have horrible side effects. After all, those side effects affect only the patient, and we all assume that she can make her own decision about whether they’re worth it. That’s not true when it comes to energy policy. At least, it’s not true for anyone who accepts the science of global warming. For us, fossil fuel use is something that we’d like to see cut back as a positive good all by itself. This is, to restate the obvious, because the side effects of fossil fuels don’t affect only the person driving his car to work. They affect everyone. Now, it’s true that carbon taxes have only a modest effect on fossil fuel use. If the IMF’s estimates are correct, this is partly because even the long-term elasticity of oil is fairly low, and partly because when we cut back on oil in rich countries it immediately gets snarfed up by developing economies eager for growth. But this is why no serious environmentalist thinks of carbon taxes as anything other than one piece of a broader plan to cut back on greenhouse gas emissions — sort of like providing a tail wind for everything else that you’re doing. And I think that’s the best way of thinking about it. You want to fund research into alternative energy sources? Me too! But that means you need funding, and what better way to fund energy research than with a carbon tax? It not only provides the money you’ll need anyway, but also helps push public demand in the direction of the very alternatives you’re subsidizing. Given that we’re quite obviously going to need new taxes in the future, I have a hard time seeing the downside of a carbon tax. I mean, what would you rather tax instead? Labor? Capital? Consumption? 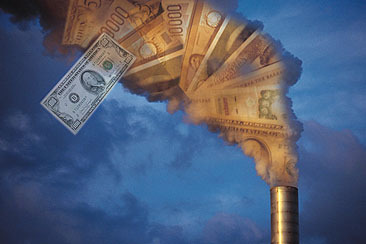 No matter what your political preferences are, surely taxing carbon is a better bet than any of those three?